(Newser) – British engineers say they've launched a "sewer war" against a giant blob clogging London's sewers, reports the AP. Thames Water officials said Tuesday it will likely take three weeks to dissolve the outsize "fatberg." 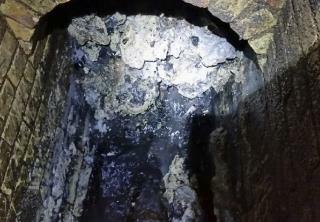 They caution against expecting quick results as the fatberg is 275 yards long and weighs as much as 11 double-decker buses, or roughly 143 tons, per the BBC. This is right next to the flat where the woman tried to fling a poo out the window. Why oh why did I read this. :::Barf::: And why oh why are people putting diapers in the toilet?!!? They need a mass education campaign. Immediatement! That is totally freaking disgusting. Where is Godzilla when you need him?